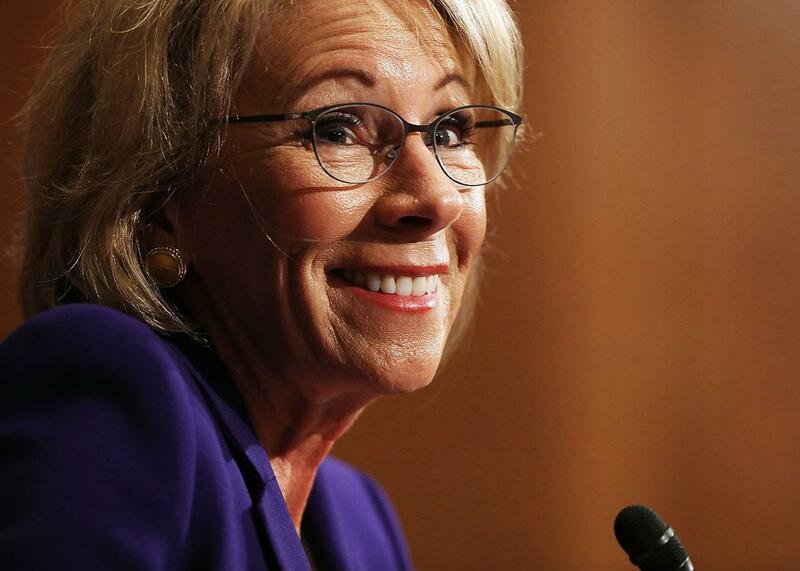 Betsy DeVos thinks education needs to be more like business. Wrong. Betsy DeVos is right that some government services should be approached more like businesses. She’s wrong to think education is one of them. Secretary of Education Betsy DeVos testifies during her confirmation hearing on Jan. 17 in Washington, D.C.
During her questioning of Betsy DeVos, Donald Trump’s just-confirmed pick for secretary of education, Washington Sen. Patty Murray asked whether DeVos believed that “fundamentally different types of corporate control structures—governance by owners versus governance by trustees—results in different decisions and behaviors by for-profit institutions compared to nonprofit and public schools?” DeVos’ one-word answer—“no”—spoke volumes about her worldview, one she shares with other business-minded members of the Trump administration. Unfortunately, it also reflects a fundamental misunderstanding about the nature of enterprise, one that could lead, in our view, to a dangerous misdirection of federal resources in the years to come. Governments, nonprofits, and for-profit businesses tend to operate in different sectors with good reason, and bringing too much for-profit thinking into the running the Department of Education (and other branches of government) will make it do its job less effectively, not more efficiently. It is often taken as an article of faith among business executives that the profit motive has an almost magical ability to get any job done better and quicker. It’s a seductive logic: Motivated by self-interest, businesses will make high-quality products (lest they lose customers) and cut costs to boost their margins. It’s win-win. And in many cases, profit motives do lead to efficient outcomes. Consider Starbucks, which recently added Sous Vide Egg Bites to the menu. (If you haven’t, try them—you won’t regret it.) The reason wasn’t necessarily an intrinsic desire to make customers happy but rather a keen understanding that Starbucks now has chains like Peet’s nipping at its heels and that customers can quickly tell a good egg bite from a bad one. But education is not coffee or an egg bite. And to see why this matters, it’s important to understand that the profit motive narrative works best in a setting that satisfies the very long list of requirements for what economists call “perfect competition”: lots of companies competing for customers; full information about who is selling what, and no uncertainty about the product’s quality on delivery. If, for example, one business dominates a market, there is no reason that business efficiencies should be passed onto customers in the form of lower prices—they may all just be kept as profits. That’s why we have antitrust laws, disclosure policies, and regulatory inspections—important, if imperfect, government tools that protect consumers when a market can’t do the job. In understanding why different organizational forms have their distinct advantages, it’s useful to focus on the particular assumption that market participants can write a contract that ensures a good or service is delivered as expected. In reality, there’s no such thing as a complete contract. There are always corners that can be cut or loopholes that can be found to pad the bottom line, at the expense of quality. A nonprofit or government service provider will be less motivated to trade quality for cost-cutting because there isn’t any owner whose profits increase from it. This turns the profit-is-good argument on its head. For-profits are motivated to secretly (or noncontractually) cut corners at the expense of customers. The answer, unsurprisingly, therefore isn’t that for-profits are better than government or vice versa. In practice, they tend to be better at different things. There’s a reason why the government tends to contract out activities like building highways or supplying paper to government offices, in which it’s (relatively speaking) easy to specify what’s to be delivered and at what price, with multiple competitors vying for the business. This is less apt to be the case in, say, correctional services or schools. A classic study on government outsourcing, published in 1997, in fact focuses on prisons as a case in which for-profit ownership is likely to go awry. Prison owners do not profit (in fact the opposite may be true) from rehabilitating inmates or letting model prisoners out for good behavior—while this may be good for society, it might leave prison cells empty or create more (costly) turnover in who fills them. So companies that manage prisons might be tempted to set up inmates to get caught on pointless infractions to extend their stays or shirk on rehab. In other words, one can imagine a policy that improves prisoner behavior allowing for early release that might reduce the need for prisons altogether. This would be wonderful for society but terrible for a for-profit prison. Yet if investor response to the election is any indication, the Obama administration’s promise to close for-profit prisons is sure to be reversed: Share prices of the two main correctional service providers, CoreCivic and the Geo Group, have doubled since the election, suggesting lots more business (and profits) on the horizon. Education has its own set of contractual challenges. Much of the debate over U.S. education has centered on nonprofit charters versus traditional public schools, perhaps because for-profit charter schools are still a decidedly modest presence in America. But a Trump-led government may encourage more of them (though DeVos, under pressure, apparently reassured fence-sitting senators that she had no plans to foist voucher-based systems, which pay for students to attend private school, on the states). To see where we may be heading, let’s look to Sweden, a country that, despite its reputation as a Scandinavian nanny state, opened its schools to the kind of choice-based system that DeVos has long championed in the early 1990s. Most of the new voucher schools were run for a profit. Research by Swedish economists found that for-profit schools were more likely to manipulate their students’ test scores upward but did a poorer job of actually educating their students, as reflected by poorer “value added” measures of government-graded standardized test-score improvements. None of this is to say that government is necessarily run with optimal efficiency (though there are lots of great managers in the federal bureaucracy—the unsung heroes of American government). And, having more than 20 years of combined experience teaching MBAs and executives, we see many situations in which business thinking can improve government. What we are saying is that Americans make trade-offs when we let businesses take care of jobs that have traditionally been handled by government. We even make these trade-offs when we let business thinking into the running of government, leading to an excessive focus on cost-cutting or performance benchmarks. In an education setting, this might translate into a mania for boosting test scores. We saw the perils of that with the Atlanta Department of Education scandal in 2010, when a scheme to inflate student test scores was uncovered. The misbehavior stretched all the way up to the district superintendent. So let’s hope that Trump’s Cabinet of billionaires will bring some business-minded efficiency to government. But comments from Betsy DeVos and others suggest they might not appreciate that such changes will come with very real costs. We learned this the hard way with for-profit prisons (a lesson we may be about to unlearn), and, unfortunately, we may soon have the chance to see whether business thinking will lead to the same sorts of calamities in education.